Junkfood Science: Does it really matter how your numbers measure up? Or can you ditch the tape measure? 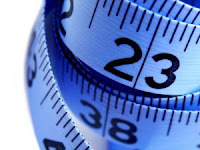 Does it really matter how your numbers measure up? Or can you ditch the tape measure? Why was one of the most important studies from the U.S. Centers for Disease Control and Prevention buried? Can we tell by a physical feature or measurement what our risks are for dying prematurely? As increased body weight and now BMI (body mass index) have proven to be poor predictors of mortality risk, the explanation sometimes suggested is that BMI doesn’t differentiate fat (“bad”) from muscle (“good”). * Increasingly trendy ways to identify “unhealthy obesity” include measures such as body fat, the shape of bodies (“apple” or “pear” figures), waist circumference and waist-to-hip ratio (“belly fat”). 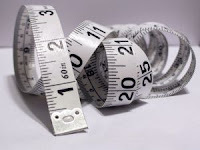 Do any of these measures really matter or are they just different ways to make us self-conscious about our bodies and provide marketing tools for healthy diets, lifestyles and anti-obesity programs? The best way to answer these questions and determine if there’s even a credible link between a body measurement and mortality is to look at the most reliable and objective data available: actual measurements on a large representative sample of the population and actual mortality data. Senior scientists at the National Center for Health Statistics at the CDC and the National Cancer Institute did just that. Their results were published in this month’s American Journal of Clinical Nutrition. ● For intermediate levels of each body measure compared with the reference measurements, the associations with all causes of mortality were negative (-1.8% to -9%) — meaning, having higher than ideal numbers were associated with lower mortality — and the association with percentage body fat was only 0.1%. ● Finally, for the highest measurements — regardless of the anthropometric or body composition variable — there were no tenable correlations to excess mortality — they were all statistically weak, ranging from -1.7% to 1.5% compared to “ideal” numbers. In other words, having a higher number for any measure of body shape or size, or body composition, is not predictive of higher risks of dying from all causes compared to people with “healthy” numbers and picture-perfect bodies. In fact, like the preponderance of evidence supports, thinner isn't better and the healthiest numbers appear to be those larger than current recommendations. Threatening the largest, fattest among us with early graves simply is not supportable by objective measures. With BMI shown to not be a credible measure to predict greater risk of dying from all causes, what the authors did next may have seemed overkill, but necessary to address the continued stigma associated with obesity. These senior scientists at the National Center for Health Statistics had previously found that among U.S. adults, there is “little or no association of excess all-cancer mortality with any of the BMI categories. None of the estimates of excess deaths was statistically significantly different [from null].” In this study, they proceeded to look specifically at deaths just from causes popularly believed to be associated with obesity. Was adiposity really associated with higher deaths from these conditions? They examined deaths from 21 different “obesity-related” diseases, including: cardiovascular disease, cancers (colon cancer, breast cancer, esophageal cancer, uterine cancer, ovarian cancer, kidney cancer, or pancreatic cancer) and diabetes or kidney disease. For the low risk level of measurements, the associations with deaths “were all quite small and close to zero,” they wrote. 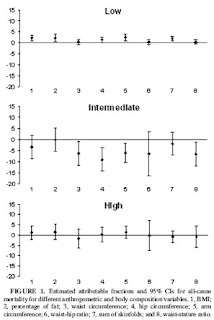 There were no statistical associations for the intermediate levels. Finally, “for the obese level, none of the 21 differences would have been significant even at a P value of 0.05,” they reported. Without even a credible association, being fat cannot be pointed to as a credible cause. How have we been misled? As the CDC authors explained in reviewing the body of evidence, the very same flaws that have plagued the methodology of studies behind the denunciation of obesity based on BMI, now afflict claims based on these alternative measures. When we disregard the principles of fair test — quality of the data (subjective versus actual measurements), objectivity and selectivity (randomized and representative of population), control for bias and confounding factors, interpretations of findings, etc. — it’s easy to be persuaded of something that isn’t scientifically sound. The most notable problem is failing to understand what “risk factor” means and that “correlation is not causation.” The literature often reports weak associations in terms of relative risks, rather than absolute risks, they said. 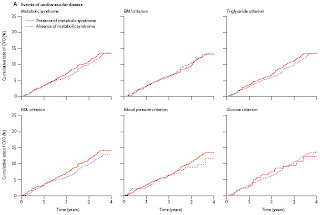 “Relative risks compare the risks at lower and higher levels of a variable, but do not provide estimates of the overall contribution of these levels to mortality.” It is often assumed that any associations between BMI and mortality are due to adipose tissue, but actual mechanisms for blaming fat tissue have yet to be explained, they pointed out. Meanwhile, significant confounding factors affecting health outcomes, such as social and economic factors or even age are often not considered in correlations, and ignore that larger body size and fat can offer survival advantages. These findings do not suggest that the weak adiposity- mortality associations would be stronger if measures of adiposity other than BMI were used. Everywhere we turn, tape measures are being unfurled and our waists and hips measured, our bodies are weighed and pinched — all purportedly to measure our health and risks for an early grave. But they don’t. Foremost, they are measures of the natural, hereditary diversity of human body shapes, types and sizes, and reflections of aging. But convincing us that fixating on our appearance and how our body measures up is more than superficiality, but about “being healthy” — and convincing us that judging others by their bodies and how they measure up is more than prejudice, but concern “for their health” — sells much more than tape measures and health risk assessments. Whether it’s someone telling us what to do if our BMI and waist measurements don’t meet government guidelines, how to get rid of belly fat, or what to do if our waist-to-hip ratios and body shapes aren’t ideal — the advice is the same: diet, exercise and lose weight. Obesity, healthy eating and lifestyles are big business and big government. This latest study from scientists at the CDC used the government’s soundest and most objective data evaluating the risks of death associated with people larger than government recommendations. Why was this major study buried? Where were the press releases and thousands of headlines? © 2009 Sandy Szwarc. All rights reserved. * This explanation seems to be most popular with men, who naturally have considerably less body fat and more muscle mass than women. They carefully ignore the fact that even the most ‘morbidly obese’ women live longer than ‘normal’ weight men. It’s not about fat or body type. ** How many people read reports closely to see what they’re really saying and what the evidence really shows? A recent consensus statement on waist circumference issued by government and private obesity and diabetes stakeholders was published concurrently in the journals Obesity and Diabetes Care and offers a good test in reading comprehension. This consensus statement illustrates just what Drs. Flegal and Graubard at the CDC were saying. 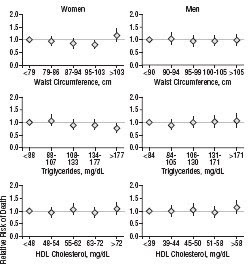 Based on NHANES III data, 99.9% of men and 98.49% of women would have received the same treatment recommendations proposed by the NHLBI Expert Panel by evaluating BMI and other cardiovascular risk factors, without an assessment of waist circumference. However, it is likely that different waist circumference cutpoint values could provide more useful clinical information… for identifying “metabolically obese, lean” patients who might benefit from lifestyle therapy but would not have been considered for treatment because of a normal BMI. In other words, it provides a means to include more people in need of lifestyle interventions to get them to eat and live a certain way. However, while the metabo syndrome is used to promote a plethora of preventive health interventions and pills, as we’ve seen, none of the risk factors in the metabolic syndrome has been shown to credibly predict cardiovascular disease or premature death.